Turn your existing stereo, home theater, or professionally installed speakers into a wireless streaming system with CONNECT. Add two additional rooms to your existing set up with a pair of PLAY:1 wireless speakers and control them all from any device. Play different songs in each room, or the same song everywhere. CONNECT seamlessly transforms your existing stereo, home theater system, or other audio device into a multi-room Sonos music system. Stream all the music on earth to your existing stereo and control from anywhere with your smartphone or tablet. Bring music to two additional rooms of your home with 2 PLAY:1’s. Mini but mighty, they bring deep, crystal clear sound to every room, transforming your home into a three-room streaming music powerhouse. 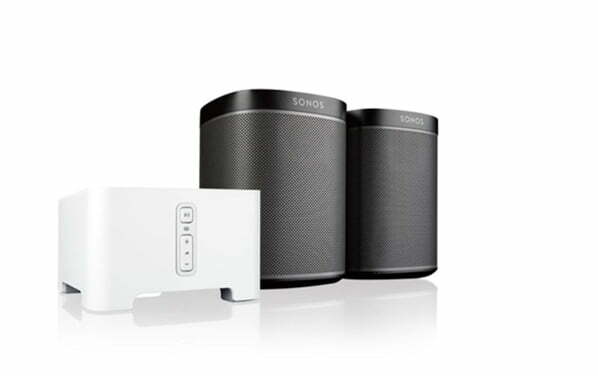 The Sonos Play:1 2 Room Music System + CONNECT Bring music to two additional rooms of your home with 2 Sonos PLAY:1’s and the Sonos CONNECT easily connecting them. Mini but mighty, they bring deep, crystal clear sound to every room, transforming your home into a three-room streaming music powerhouse. Enjoy superior audio quality with analog, optical, and coaxial digital audio outputs engineered for premium performance. Fixed or variable audio output options provide flexible volume control. Get instant access to millions of songs and thousands of radio stations without ripping, downloading, or even turning on a computer. Sonos Play:1 connects directly to these services over the Internet and then streams the music to the rooms of your choice.